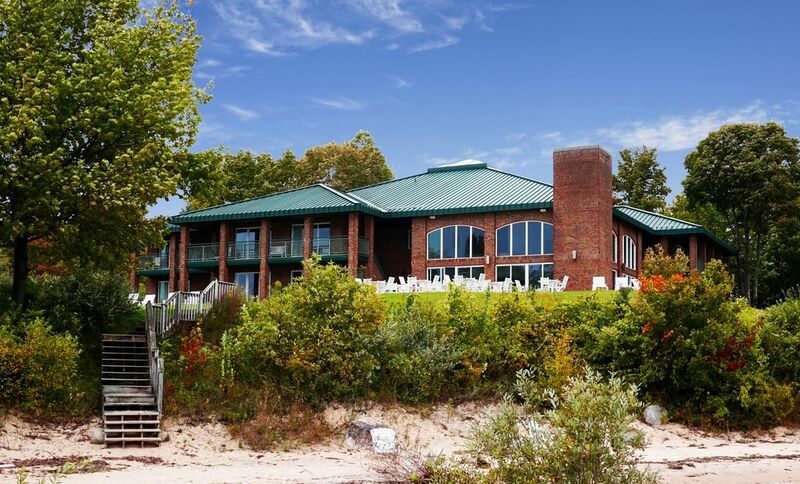 16 bedroom; 19 bathroom 22,000 square foot contemporary lodge on six and a half acres with 340 feet of frontage on Northport Bay. Full kitchen with a dining room that seats 64. Full recreation room with pool tables, shuffleboard, ping pong, air hockey, foosball, big screen TV; wet bar, arcade, etc. Fitness Center; laundry rooms; meeting rooms; living room with fireplace; 12 person bayside hot tub. Rented in it's entirety only. Leelanau County is full of rolling hill, orchards, wineries, golf courses, lakes for fishing, swimming and boating; Sleeping Bear Dunes National Lake shore, quaint towns for dining and shopping. If you've never visited Leelanau County, do yourself a favor. We built this 16 bedroom home to accomodate our own extended family for annual summer vacation. Leelanau County is a gorgeous county filled with rolling hills, wineries, beaches, etc. You get exclusive usage of this 16 bedroom 32 bed facility. You can prepare large family meals in the kitchen, and all dine together. Your family or group is the only on there. No staff, no other guests. Our property can sleep 64, however, this website caps the instant quote at 25. In order to surpass this websites error, please keep your total at 25 in the instant quote section and then include actual counts in your notes in the inquiry. You may also pass the instant quote and go to "email owner inquiry" instead. We apologize for VRBO's inconvenience.